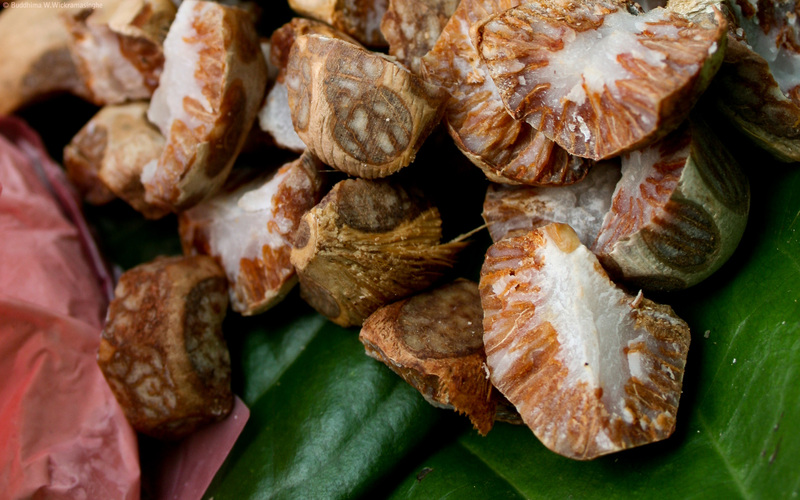 The cancer-causing areca nut contains compounds that could help smokers and nut chewers quit. What would you say if we told you that an addictive, cancer-causing substance could help you safely stop using another addictive, cancer-causing substance? Sure, it sounds far-fetched. But it may be true. Chemicals found in the areca nut, which millions of people in Southeast Asia chew for its stimulant properties, could one day help people quit using tobacco. According to ongoing research presented on Wednesday at the 253rd National Meeting & Exposition of the American Chemical Society, chemists have identified alkaloids in the seed of the Areca catechu palm that may help smokers quit their unhealthy habit without the negative side effects caused by some of the commonly available smoking cessation drugs. Nicole Horenstein, a chemist at the University of Florida, estimates that 600 million people use the areca nut regularly. The nut, known for its mild stimulant properties, is often wrapped with leaves from the betel vine to form what’s known as a “quid.” Areca chewers often add spices, calcium hydroxide (slaked lime), and sometimes tobacco to the quid. Users chew it and hold it in their mouths, in much the same way that people in the United States use smokeless tobacco products such as snuff or chewing tobacco. And just like these tobacco products, betel use is strongly associated with oral cancer. But despite the areca nut’s carcinogenic properties, Horenstein and her colleagues have identified some interesting compounds in the nut that could help both tobacco users and areca nut users quit their habits. 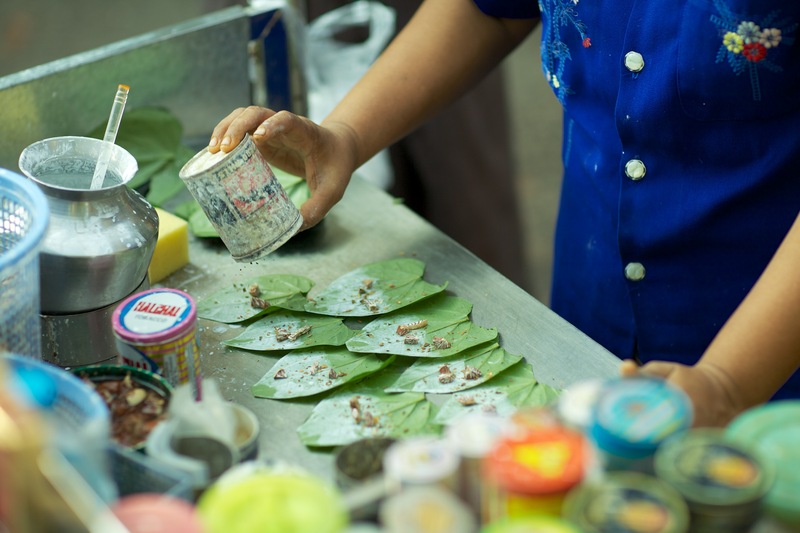 This street vendor prepares areca nut quids with betel leaves and slaked lime. Chewing the areca nut quid produces tell-tale red spit. The key to this possible new tool in the public health battle against nicotine addiction is the alkaloids found in areca nuts. Horenstein’s team has found that some of the nut’s alkaloids could be better at targeting the desired brain receptors to treat nicotine addiction than other smoking cessation drugs such as the popular drug Chantix (varenicline). While varenicline binds to nicotine receptors in a person’s brain to help them not crave a cigarette, it also binds to some unintended receptors, causing side effects like sleepwalking and suicidal thoughts. The researchers conducted this study on frog cells that contain the same receptors areca nut affects in the human brain and body cells, and they found that the molecules they’re developing from areca alkaloids can target these receptors more precisely, accomplishing the same goal as Chantix without the negative side effects. Arecoline and Guvacoline are two of the alkaloid molecules in areca nuts that could show scientists better ways to help people quit smoking. While this research is still in its early stages, this report suggests that the concept is based on solid science. Horenstein says that the next steps are to enhance the potencies of these molecules and test them in animals. Abstract: The Areca nut is well known in southeastern Asia as the source of muscarinic active alkaloids that constitute a popular addictive drug known as the betel quid, in which limed extracts of the nut are rolled in betel vine leaves and in some cases, include tobacco. Of the four known alkaloids in Areca, arecoline is the most active muscarinic agonist while guvacoline is less potent. Arecaidine is an M2 selective agonist. Muscarinic activity has not been reported for guvacine, a GABA transport inhibitor. Two electrode voltage clamp electrophysiology experiments in Xenopus oocytes expressing muscarinic or nicotinic receptors have revealed that in addition to muscarinic activity, arecoline displays weak nicotinic partial agonism with a selectivity profile favoring α4β2 and α6β2β3α4β2 subtypes considered as targets for therapeutics aimed at nicotine addiction, while avoiding α7, α3β4, and muscle-type nAChR. This is in contradistinction to the known therapeutics cytisine and varenicline which although capable of partial agonism at α4β2 and α6β2β3α4β2 receptors, are strong agonists of the α7 receptor, and show significant activity at ganglionic α3β4 receptors. The arecoline analog isoarecolone shows an even more pronounced selectivity for α4β2 and α6β2β3α4β2 receptors compared to arecoline. It is noteworthy that whereas arecoline shows significant muscarinic activity, primarily at M1 mAChR, isoarecolone has nearly abolished activity at M1 and significantly reduced mAChR activity in assays against co-expressed M1, M2, and M3 receptors. Isoarecolone thus represents an interesting template for the development of new agents targeting α4β2 and α6β2β3α4β2 receptors. Interestingly we have found that Areca extracts also demonstrate an inhibitory component acting at nicotinic receptors. Fractionation based on size revealed that while both mAChR and nAChR activities resided in the low molecular weight fraction < 1 kDa, the inhibitory component was large with an estimated size > 10 kDa. These results will be discussed in the context of development of new therapeutics aimed at smoking cessation.